Alberto Zorzi (ITA) blazed his way to victory in Berlin beating off a ferocious challenge from home star Christian Ahlmann (GER) in a heavyweight jump off. Zorzi has become the 12th rider to join the star-studded line up of qualifiers for the Longines Global Champions Tour Super Grand Prix at the first-ever GC Playoffs in Prague in December. In the steamy heat of the German capital, as Europe’s prolonged heatwave continued, the event was a sell-out as crowds filled the grandstands and grass banks ringing the natural amphitheatre of Berlin’s Sommergarten. German course designer Frank Rothenberger put together a big and delicate but fair course, featuring wide oxers that needed plenty of power interjected with light verticals requiring absolute control and precision in the smaller oval arena. A solid wall, with the Brandenberg Gate emblazoned across the facade, caused a couple of horses to have a look, and a wavy Sapinda vertical placed just by the in-gate asked for full focus. Fences came up thick and fast, and other challenges included a wide DKB oxer with a water tray underneath, a long Longines treble and a delicate GC gate to finish with in the 77-seconds time allowed. There was disappointment for home hero Ludger Beerbaum (GER) with Casello, the pair clipping a vertical to collect four faults and rule them out of contention for a win today. Other top riders tried, and failed, to take on the course, with riders such as Simon Delestre (FRA), Lorenzo de Luca (ITA), Sheikh Ali Bin Khalid Al Thani (QAT), Harrie Smolders (NED), and Edwina Tops-Alexander (AUS) all picking up faults today. First to deliver a clear was Belgium's Niels Bruynseels (BEL) and Cas de Liberte - the pair taking the course effortlessly in their stride. But there was heartbreak for compatriot Constant Van Paesschen (BEL) and the 9 year old stallion Jilbert van' T Ruytershof, the pair jumping beautifully but picking up a single time fault. Spectators' hopes of a home win rose after Daniel Deusser (GER) delivered a spell-binding round with Calisto Blue, fans cheering ecstatically as the duo flew through the finish gates clear to create a jump-off. They were joined by Alberto Zorzi (ITA), riding Fair Light van T Heike, who said he was fired up for a clear after disappointment in the earlier GCL class. Formidably fast combinations joined the jump-off line up with Pieter Devos (BEL) and Claire Z, last year’s winner Christian Ahlmann (GER) with Clintrexo Z, Martin Fuchs (SUI) with Clooney, Marcus Ehning (GER) with Cornado NRW and Kevin Staut (FRA) with Lorenzo throwing their hats in the ring. Niels Bruynseels (BEL) was the first of eight combinations in the jump off going clear with a time of 39.10s which was clearly not going to be fast enough. Daniel Deusser (GER) went clear with Calisto Blue but was slower still in 41.04s. The temperature rose dramatically as Alberto Zorzi (ITA) and Fairlight blasted into the arena. Alberto really challenged his horse and Fairlight responded enthusiastically. Taking one stride less at a couple of fences and then accelerating to the final the pair crossed the line in a stunning 35.53s and looked unbeatable. Pieter Devos (BEL) made a big effort to catch Alberto but finished in 37.96. A brilliant round by Christian Ahlmann (GER) and Clintrexo Z was actually ahead of Alberto at several points on the course but the German champion lost his stirrup in the run to the last fence and a wide turn left him on 36.65s. The remaining challengers Martin Fuchs (SUI), Marcus Ehning (GER) and Kevin Staut (FRA) all suffered four faults putting them out of podium contention. So it would be a win for the Italian rider, his first so far this season, as he adds his name to the list of stars lining up for the LGCT Super Grand Prix. The Tour now looks to London, and Ben Maher's (GBR) home event - taking place at the prestigious Royal Hospital Chelsea. Pieter Devos, third place: “I knew Alberto would go on six - I planned to do it, but when she landed she felt a bit [flat] and I didn’t see the distance so I went for seven. I knew he would be difficult to beat, and I have a relatively young horse. I did what I could but it wasn’t fast enough!" 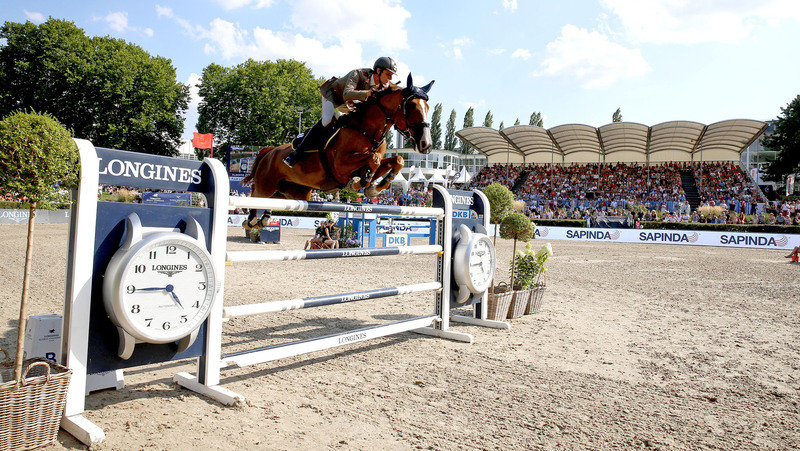 Christian Ahlmann, second place: “I really happy with [my horse] - he gets better at every show. In this jump-off I knew Alberto was quick, so I just tried to do my best. My horse did really well, he fought for me. To the last fence I lost my stirrup so I had to do one extra. Perhaps I had the possibility to win, but anyway I’m super, super happy with my horse and I didn’t expect second today. So I’m happy!" Alberto Zorzi, first place: “Jan told me that after the double I should go straight away for the six strides - and I did it! I tried hard today and took the first distances. I came a little close to the first oxer but Fair Light helped me out. She is an amazing horse, she’s had a few weeks to relax and now came here very good. The last few weeks have been good for me. I’m so excited to qualify for the Super Grand Prix in Prague."